Adaptive gradient methods such as Adam, Adagrad, Adadelta, RMSProp, Nadam, Adamw, were proposed over SGD with momentum for solving optimization of stochastic objectives in high-dimensions. Amsgrad was recently proposed as an improvement to Adam to fix convergence issues in the latter. These methods provide benefits such as faster convergence and insensitivity towards hyperparameter selection i.e. they are demonstrated to work with little tuning. On the downside, these adaptive methods have shown poor empirical performance and lesser generalization as compared to SGD. The authors try to address this problem by designing a new optimization algorithm that bridges the gap between the space of Adaptive Gradient algorithms and SGD with momentum. With this method a new tunable hyperparameter called partially adaptive parameter is introduced that varies between [0, 0.5]. The recommended version for running the experiments is Python3. Follow the installation guide on Tensorflow Homepage for installing Tensorflow-GPU or Tensorflow-CPU. Follow instructions outlined on Keras Homepage for installing Keras. Run a vanilla experiment using the following command at the directory root folder. You can set the experiment configuration by changing the dictionary in the run.py files. These dictionary contains all the hyperparameter for the each optimizers ie. Adam, Amsgrad, SGD Momentum and Padam. 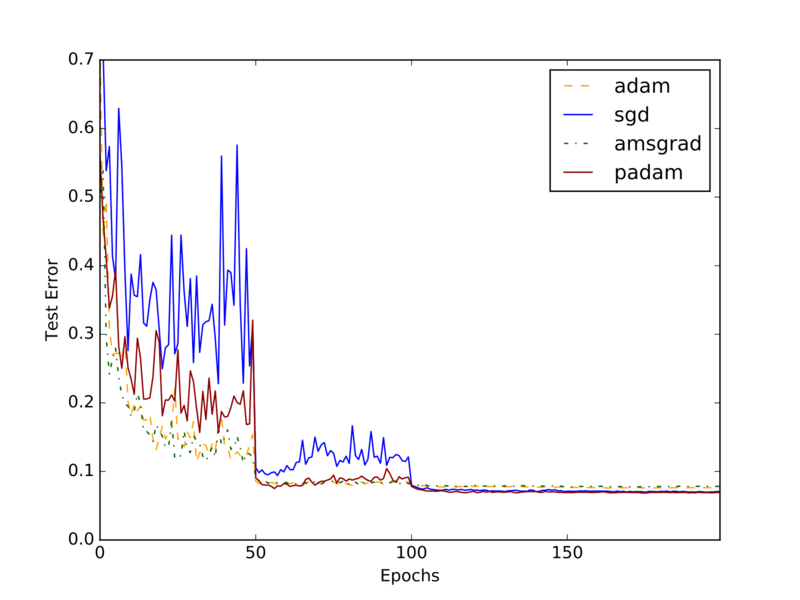 We carry out the experiments to compare the performance of four optimizers - Adam, Amsgrad, SGD Momentum and the proposed algorithm Padam, on 3 modern deep learning architectures ResNet18, WideResNet18 and VGGNet16, over CIFAR-10 and CIFAR-100 datasets. All the experiments have been run for 200 epochs, using categorical cross entropy loss function. We were sucessful in reproducing the results as predicted in the paper for Cifar-10 and Cifar-100. 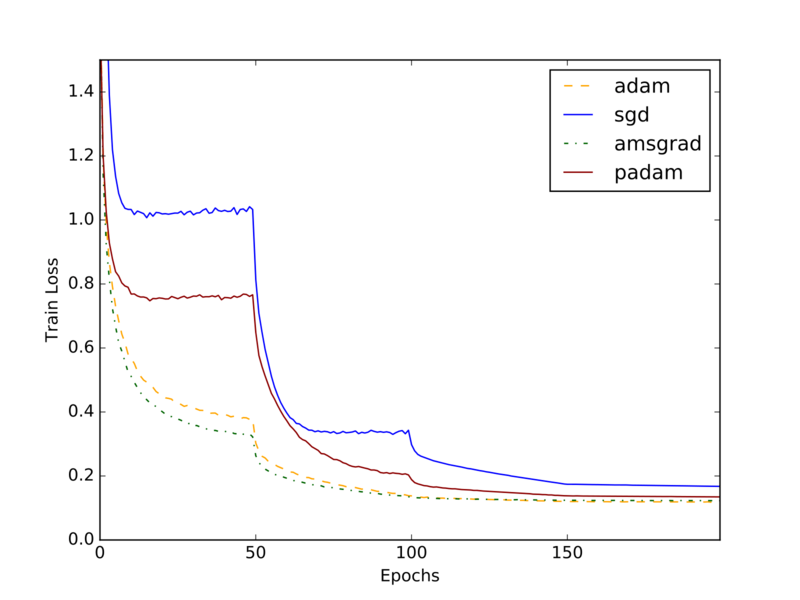 It is observed that Padam indeed generalizes better than other adaptive gradient method, although it does have a few shortcomings as mentioned in our report. Here, we show the results for VGGNet16, rest of the results have been included in the report. Results on the CIFAR-10 dataset for VGGNet.